｜2015-04-28｜Gallery page and Special page have been updated! ｜2015-04-10｜Gallery page has been updated! ｜2015-04-01｜Character page has been updated! ｜2015-03-25｜Gallery page and Special page have been updated! ｜2015-03-19｜Screenshots and trailers have been added! ｜2015-03-13｜Character page has been updated! ｜2015-02-25｜Character page has been updated! ｜2015-02-19｜ Story, Screenshots and Opening movie have been added! ｜2015-02-11｜ System page and Music page have been updated! ｜2015-01-07｜ System page has been updated! ｜2014-11-25｜　Character page and System page have been updated! ｜2014-11-18｜　Omega Quintet Official Website launched!! © 2015 IDEA FACTORY/COMPILE HEART. All rights reserved. 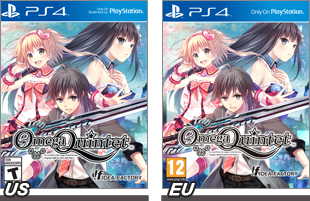 Omega Quintet ™ is a trademark of Idea Factory. Licensed to and published by Idea Factory International, Inc. Distributed exclusively by Atlus U.S.A., Inc. The “PS” Family logo and “PlayStation” are registered trademarks of Sony Computer Entertainment Inc. “PS4” is a trademark of the same company.